Photograph copyright – Philip Harris, 2014. All rights reserved. Canada can be a very cold country but Vancouver has a pretty mild climate, it’s very similar to England really. But this February we hit some of the lowest temperatures we’ve seen since we got here (< -10C). Not too cold to go out or anything crazy like that, and we’ve only had a few cm of snow but it was cold enough that even locals were commenting on it. 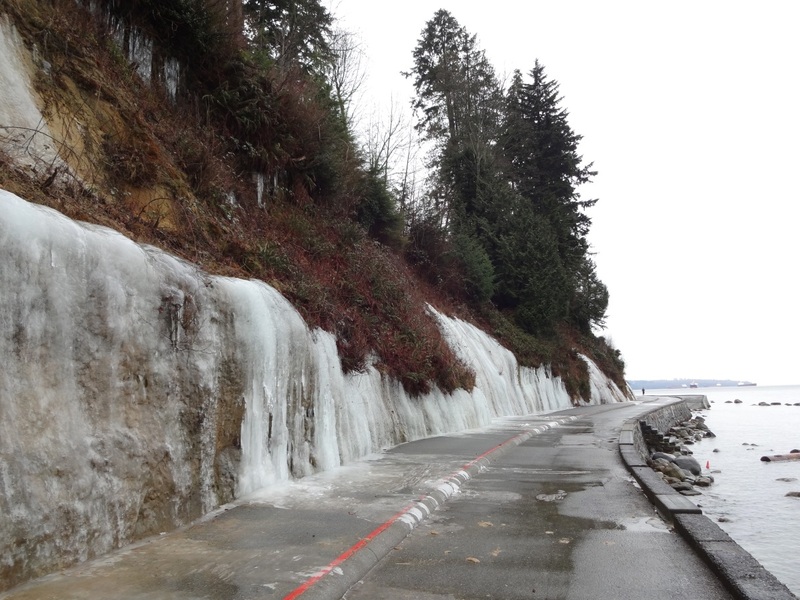 The photograph above is of the cliffs along the seawall at Burrard Inlet. It rains a lot in Vancouver and water drains into the sea from the forest above. The cold temperatures went on long enough that the water froze, creating these walls of ice and some fantastic icicles. It only lasted a couple of days and we’re back to rain now but it was very impressive while it lasted.